Among the items up for sale during Christie's auction house in New York City upcoming in April is this stunning diamond ring. 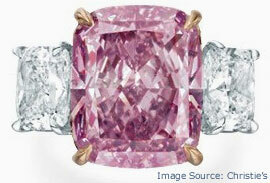 The center diamond is a 10.09 carat modified cushion cut fancy vivid purple-pink diamond, GIA certified SI1 clarity. Flanked by a pair of cushion cut white diamonds and mounted in 18K rose gold and platinum ring. Accompanied by a supplemental letter stating that the diamond has been determined to be a Type IIa pink diamond. Type IIa pink diamonds are very rare in nature, often have relatively few inclusions and are noted for their homogenous color in the rough. Unlike many other colored diamonds, the color in pink diamonds can not only be caused by impurities, but it may also be a result of the diamond's exposure to heat and pressure during transportation into the earth's crust. Type IIa pinks have been found in a number of mining regions around the world. Historically they were found in India (particularly from the Golconda region) and, in more recent times, most notably from Brazil and Africa.